Seven videos about Barack Obama, Hillary Clinton, Macintosh 1984, YouTube, political advertising, and our new social media landscape. Is "Hillary 1984" an amateur video? Is this a clever product-placement marketing ploy by Apple Macintosh? Is this the new expressive face of citizen media? How did this video remake become a political statement? Let’s examine both more closely. Here is the famous, ideological, original Macintosh 1984 Superbowl TV ad. And here is the new ideological remake of the same commercial. What are the differences – and do these differences make any difference? 1. 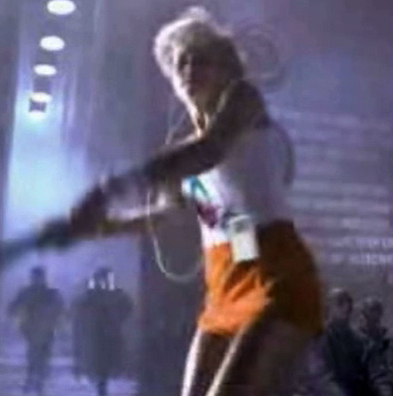 In the original, the woman (athlete, Anya Major ) wears no iPod. Why? It is because Apple authorized this new version of the Original in 2004 to publicize the company’s 20 year anniversary… and, of course, to promote their new iPod product. Apple digitally composited the iPod onto her body. The Obama remake video was manipulated from this second version. Why? 2. In the Original, Big Brother is announcing totalitarian propaganda. In the Remake, Hillary is discussing her presidential candidacy. Is this the same thing? Maybe, but in comparison, Clinton’s language is warm, earnest, and inviting. Nor does she look menacing. Her head remains largely within the frame, not as tightly shot as Big Brother. Why? 3. In the Remake, the technical expertise of the visual manipulation is rather crude, as is the audio splicing. Is this intentional? 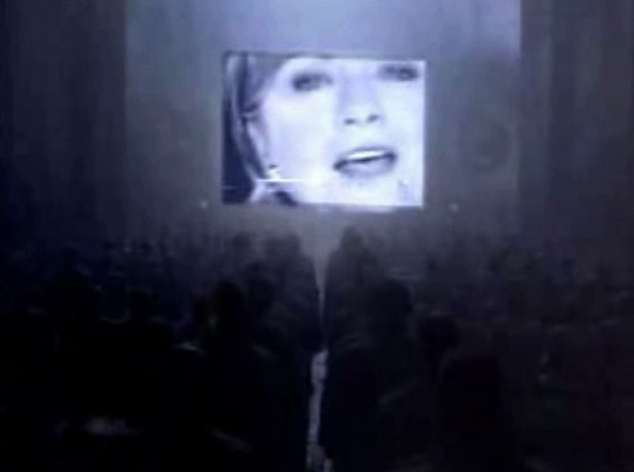 For instance, the shapes of the video screen are not accurate; the Obama logo on the t-shirt is poorly positioned; and the over-all editing is not identical – the Remake has several fast cross-fades, instead of the hard cuts in the Original. Why? 4. 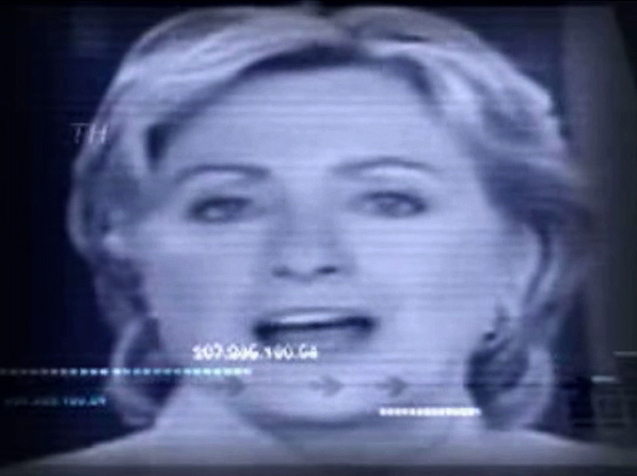 The Remake video is longer, by seven seconds, in order to extend Clinton’s spoken text. Why? In this extension, Hillary speaks of “joining the team, the American team.” Why? 5. But this same extended segment also contains new text superimposed across the large screen. It reads: “BE PART OF THE TEAM.” (cut to troops, cut to hammer toss, cut to close-up) “THIS IS OUR CONVERSATION.” Is there a hidden message here? If so, what is it? Are we being asked to join some covert discussion group? Why? What kind of “oppositional reading” does this Remake inspire? 6. The credits also are dissimilar length, because the Remake used a shorter, partial clip, and then slowed it down (the clothing does flap as fast), over which new type is scrolled. Why? 7. In the Remake, the fake Obama-Apple logo is missing the bottom blue stripe. Why? Is it just clumsy artwork? In all, what is the big fuss here? There are MANY other, more biting, disparaging, and cynical political statements than this. Does this video manipulation add up to any kind of critical political persuasiveness? No, instead, it portends something much worse - because there is no clear indication of who made this Remake (parkridge47), or why. In our fragmented media environment, manipulations of this sort (it is not a ‘mash-up” in the traditional sense) are the most dangerous kinds of personal media. How so? It is because the video is UN-SIGNED. Conspiring to speak publicly in this manner – without contextual accompaniment - is cheap, deceptive, and itself a dirty political trick. The Internet is a public sphere; and within it, political discourse is a public duty for every citizen. Making political movies of ANY ideological stripe can and should be attempted by everyone. It is good that parkridge47 exercised this right and privilege. Hiding behind anonymity, however, is the work of cowards and Little Brothers - it should not be tolerated, promoted, or rewarded. In our rush to join political partisan dialogue, citizen videos like these, without ownership, become media terrorists – visual suicide bombers against free speech and open democracy… they innocently walk up to us, explode and damage; without a face, without a warning, without a remedy. We must all take responsibility for our media; it is the primary democratic privilege that enables all others. NOTE: Philip de Vellis, a strategist with Blue State Digital, the firm which designed Obama's Web site, acknowledged he is "ParkRidge47,'' creator of the ad.